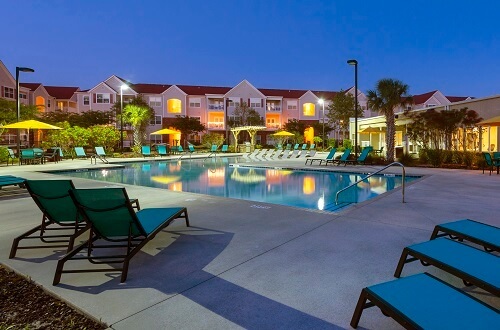 Aspire349 is a 228-unit Class A student housing community serving the University of North Carolina @ Wilmington in Wilmington, NC. The property is located at 349 Campus Cove and just over one half mile from campus allowing convenient access to academic buildings, the UNCW Commons, South College Road retail, and numerous area entertainment and dining establishments. The UNCW has grown steadily over the past ten years from 11,840 students in 2007 to 15,740 in 2016. Enrollment for 2017 was over 16,000 students and is expected to reach 18,000 within a few years. Formerly named Carolina Cove, the property was developed in 2013 as purpose-built student housing. The property consists of 228 units and 600 beds ranging from 966 square foot two bedroom two bath suites, to 1209 square foot three bedroom three bath suites. Amenities include a modern clubhouse with resort-style swimming pool, 24-hour fitness facility, bike and kayak racks, Heated Spa, Hammock garden, “Cove Lounge”, basketball court, dog park, business center, billiards table, tanning booth, beach volleyball court, and outdoor grills. Unit feature include walk-in closets, private bath for each bedroom, covered porch, in-unit washer dryer, WIFI and Cable TV and full furnishing. An property enhancement program will begin immediately after closing and will focus on upgrades to the clubhouse and community amenities as well as additional furnishings and upgrades to the unit interiors.